One week is an ideal amount of time to immerse yourself in the diversity of Delhi, India's capital city. There's plenty to see and do, and you certainly won't be idle! Incongruous Old Delhi and New Delhi make up the two distinct parts of the city. Old Delhi was once the exalted 17th century walled city of Shahjahanabad, built and occupied by indomitable Mughal emperor Shah Jahan. These days it's unbelievably crowded and crumbling but undeniably has the most astonishing sights in the city. The British formed and constructed New Delhi when they transferred their capital there from Kolkata in 1911. This neat and well-planned area is dominated by wide, tree-lined roads and dignified government buildings. Although out of the way, the upscale residential district of south Delhi is also worth visiting for its markets and trendy neighborhoods. It has some significant monuments and lovely bed and breakfasts too. This itinerary for one week in Delhi focuses on one area of the city at a time, to minimize the amount of driving in a day. This is important, as the city becomes congested with heavy traffic in the mornings from 9 a.m. to 11 a.m., and evenings from 5.30 p.m. to 7 p.m.
Delhi has a great Metro train system. However, for comfort and convenience, you may wish to hire a car and driver to get around. Your driver will take care of you, and you'll be harassed much less as well. The itinerary for Monday has been designed keeping in mind that many monuments, museums and markets in Delhi are closed on this day — including the Red Fort, Akshardham Temple, Bahai Lotus Temple, and Gandhi Smriti. Never mind though, because there are plenty of interesting things to see and do around Connaught Place, New Delhi's vibrant commercial center. 8:30 a.m.: Start the day at Agrasen ki Baoli step well (Hailey Road, off K G Marg. Open daily, sunrise to sunset. Free entry.) flanked by high-rise buildings near Connaught Place. It's thought to have been constructed by King Agrasen during the ancient Mahabharata period, and later rebuilt in the 14th century by the entrepreneurial Agrawal community. Now devoid of water, you can descend the 100-plus stairs into its depths. The step well has been featured in two Bollywood movies — PK, and more recently Sultan. 9:15 a.m.: Stop by Devi Prasad Sadan Dhobi Ghat (behind Agrasen ki Baoli. Turn right as you exit and keep walking.) to see clothes being washed the traditional way, by beating them against concrete slabs. The dhobi ghat is apparently the largest one in Delhi, and one of the last few remaining. More than 60 families of dhobis (washermen) live and work there. 10 a.m.: Walk 15 minutes to the elegant Imperial Hotel (Janpath, Connaught Place) for morning tea or coffee at its splendid, glass-domed Atrium Tea Lounge. The Imperial is one of the top luxury hotels in Delhi, housed in a restored early 1930s Colonial-style building with impeccable old-world atmosphere. Do wander around before you leave. 11 a.m.: Fixed-price Central Cottage Emporium is situated opposite the Imperial Hotel on Janpath. It stocks handicrafts from all over India. Don't expect to find any bargains there, although it's a good idea to see how much items are selling for, so you can haggle at markets later. The very popular Tibetan market, on the other side of Janpath, is an excellent place to do so. It sells everything from clothes to paintings. Not interested in shopping? Jantar Mantar (Sansad Marg, Connaught Place) is just around the corner and consists of a group of intriguing astronomy instruments, believed to have been built in 1724. 12:30 p.m.: Have lunch at Connaught Place. There are many options to choose from, depending on your palate. Parikrama (22 Antriksh Bhavan, Kasturba Gandhi Marg, Connaught Place) is a revolving restaurant with city views, serving Indian and Chinese food. The menu at Zaffran (Hotel Palace Heights, D-26/28, Inner Circle, Connaught Place) features Punjabi and Mughlai specialties. Fascinating Junkyard Cafe (91 N Block, Outer Circle, Connaught Place) is adorned with re-purposed and up-cycled trash. Here are some more suggestions as to what to eat in Connaught Place. 1:30 p.m.: Spend some time exploring Connaught Place, where there's something for everyone including art galleries and historic shops. Khadi Gramodyog Bhavan (24 Regal Building, Connaught Place) promotes India's khadi (hand-woven cotton cloth) industry. It's possible to browse for hours at the Oxford Bookstore (N-81 Connaught Place). Ram Chandra and Sons (D-1, Odeon Building, Connaught Place) is India's oldest toy store and opened there in 1935. Dhoomimal Gallery (G-42, Outer Circle, Connaught Place. Closed Sundays) dates back to 1936 and is India's oldest contemporary art gallery. It's part of a mega art complex that also includes a sculpture gallery, art museum, and art library. The newer Dhoomimal Art Center (A-8, Inner Circle, Connaught Place. Closed Sundays) is also a must-visit for art lovers. Indian Arts Palace (E-19, Radial Road 7, Connaught Place) attracts collectors from all over the world. Mahatta & Company (M-59, Connaught Place) is Delhi's first full-service photography store. 3:30 p.m.: Rest and recharge at Indian Coffee House (2nd Floor, Mohan Singh Place, Baba Kharak Singh Marg, Hanuman Road Area, Connaught Place), established in 1957. The glory days when politicians, writers, and intellectuals all hung out there have long gone. However, a bit of imagination will bring them back to life. 4 p.m.: Prachin Hanuman Mandir, built by Maharaja Jai Singh in 1724, is a short five minute walk away on Baba Kharak Singh Marg. Although it's small and its architecture isn't outstanding, the temple is noteworthy for being one of the oldest ones dedicated to Lord Hanuman (the monkey god) in India. 5 p.m.: End your day of sightseeing by soaking up the serenity until sunset at Gurudwara Bangla Sahib (corner of Baba Kharak Singh Marg and Ashoka Road). This glorious white Sikh temple complex with gold domes is centered around a huge sarovar (holy tank of water). The eighth Sikh guru, Harkrishan Dev, stayed there before his death in 1664. 7 p.m.: Sky Lounge Bar & Grill (Hotel The Royal Plaza, 19 Ashoka Road) is the highest rooftop lounge in Delhi, and it's only a few minutes walk from Gurudwara Bangla Sahib! Enjoy panoramic views across Rajpath and Connaught Place with a cocktail. Foodies will relish dinner at Delhi's hottest new fine-dining restaurant, Masala Library (21A, near Le Meridian Hotel, Janpath. Phone: 11 69400005), which specializes in experimental molecular gastronomy. Book well in advance. Throw yourself into experiencing intoxicating Old Delhi today. It will most likely overwhelm your senses, so it's best to take a guided walking tour. You'll definitely get to see more than what you would by trying to navigate it yourself. 9 a.m.: Skip your hotel breakfast and join this half-day Old Delhi Bazaar Walk and Haveli Visit, offered by Masterji ki Haveli (cost: $50 per person). As well meandering through alleyways and markets (including Asia's largest spice market), you'll be able to sample some street foods. The tour ends at one of the few remaining old havelis (a private mansion where a single family has lived for generations) for a delicious home-cooked lunch with the owners. It's enlightening and informative, and you'll get rare insight into everyday life in Old Delhi. 2 p.m.: Proceed to the imposing sandstone 17th century Red Fort (open sunrise until sunset, daily except Mondays) at the end of Chandni Chowk in Old Delhi. The fort was the residence of Mughal rulers for nearly 200 years, until 1857. Inside, there's a war museum, some shops, palace ruins, and a hidden step well. (Entry fee: 500 rupees for foreigners and 30 rupees for Indians. Free for children under 15 years old). 3 p.m.: Cross the main road to India's largest mosque, Jama Masjid (open 7 a.m. to noon and 1.30 p.m. to 6.30 p.m., daily). Ascend the narrow staircase of one of its minaret towers for a captivating view over the city. (Free to enter. However, it costs 100 rupees to climb the tower and 300 rupees for a camera). 4 p.m.: Travel 10 minutes south to Raj Ghat, a memorial to Mahatma Gandhi that's been built on the place where he was cremated (open sunrise to sunset, daily). It's situated among extensive landscaped gardens. There's also a museum dedicated to Mahatma Gandhi (open from 10 a.m. to 5:30 p.m., daily except Monday) opposite Raj Ghat. 7 p.m.: Chor Bizarre (Hotel Broadway, 4/15A, Asaf Ali Road, New Delhi) is a reputable restaurant for dinner in the area. It's been serving authentic Kashmiri cuisine for more than 25 years and has wistful old-world interiors. The name is a play on "Chor Bazaar", which means "thieves market". Morning: Visit Sanjay Colony slum in the south of Delhi with Reality Tours and Travel (cost 750-850 rupees per person). This is not poverty tourism like you may expect. Rather, it's an opportunity to dispel preconceived notions, and learn how the community thrives despite obvious challenges. You'll see small scale industry, places of worship, and residential quarters. Plus, there's the option to have a vegetarian lunch with a local family in their home. Expect to sit on the floor and eat with your hand, Indian style! Eighty percent of tour profits are invested in helping the community. 2 p.m.: Stop by the Baha'i Lotus Temple (Lotus Temple Road, Bahapur, Shambhu Dayal Bagh, Kalkaji, New Delhi), to the east of Nehru Place. This white marble temple was constructed in 1986, in the shape of a lotus flower. It belongs to the Baha'i Faith, which believes in unity of all people and religions. (Entry fee: Free for all). Afternoon and Evening: Spend the remainder of your time at Swaminarayan Akshardham (NH 24, Akshardham Setu, New Delhi), on the other side of the Yamuna River. This sprawling Hindu temple complex, with its thematic gardens, is an architectural marvel. There's so much to see that, ideally, half a day or more should be devoted to covering it. Stay until sunset for the dazzling multimedia water show. Do be aware that umbrellas, luggage, toys, food, and electronic items aren't permitted inside. This includes cameras and cell phones. There is a cloakroom where you can leave them but the line may be long. If you're hungry, grab a bite to eat at the food court inside the temple complex. (Entry fee: Free for all. However, tickets are required for the exhibitions and multimedia water show. Dress conservatively). 7 a.m.: Join fit Delhi locals on an invigorating early morning walk in Lodhi Gardens (Lodhi Road, New Delhi). This sprawling 90 acre city park is home to a number of monuments, including tombs of 15th and 16th century rulers. The gardens were built around them by the British in 1936. (Entry fee: Free for all). 8:30 a.m.: Tuck into a hearty breakfast at The All American Diner inside the India Habitat Center (opposite Lodhi Gardens on Lodhi Road). You'll feel like you've been transported back in time to the 1960s! Waffles, milkshakes, pancakes, cereal, oatmeal, pastries, eggs, bacon and sausages are all on the menu. 9:30 a.m.: Wander through the Lodhi Art District (669 to 673 Second Avenue, Block 6, between Khanna Market and Meharchand Market, Lodhi Colony), India’s first public open-air art gallery. International and local artists have painted more than 20 wall murals, facilitated by St+art India. This non-profit organization aims to make art accessible to a wider audience in public spaces. 11 a.m.: Visit Gandhi Smitri (5 Tees January Marg, New Delhi. Open from 10 a.m. to 5 p.m. Closed Mondays), where Mahatma Gandhi was assassinated on January 30, 1948. The room that he slept in has been kept exactly how he left it. There are also plenty of photos, sculptures, paintings, and inscriptions on display. (Entry fee: Free for all). 12:30 p.m.: Have lunch at swanky Khan Market (Rabindra Nagar, New Delhi), nearby. There are plenty of diverse options including Parsi cuisine and Mumbai street food at SodaBottleOpenerWala (73 Khan Market), Big Chill (35 Khan Market) for Continental cuisine, Mamagoto (Upstairs, 53 Khan Market) for Asian cuisine, Civil House (26 Khan Market) for pizza and burgers, and Parallel (12 Khan Market) for modern Indian. 2 p.m.: Browse through the upmarket shops and boutiques in Khan Market. Popular items include books, clothing, home furnishings, cosmetics and Ayurvedic skin care products. 2:45 p.m.: Head to Humayun's Tomb (Mathura Road, Nizamuddin East), 10 minutes away. It was built in 1570 and houses the body of Mughal emperor Humayun. The first Mughal architecture of its kind in India, its design inspired the more prominent Taj Mahal and you'll definitely notice the resemblance. (Entry fee: 500 rupees for foreigners and 30 rupees for Indians. Free for children under 15 years old). About 5 minutes away, you'll find Anokhi's discount store (Shop 13, Nizamuddin East Market, enter from Gate #9. Closed Sundays). Anokhi sells women's clothes made out of gorgeous block-printed cotton fabrics. The discount store stocks factory seconds and end-of-line pieces at 35-50% less than market price. 4 p.m.: Join The Hope Project for a walking tour of Nizamuddin Basti, an old Muslim Sufi village surrounding Nizammudin Dargh (the mausoleum of 14th century Sufi saint Hazrat Nizamuddin Auliya). At 300 rupees per person, it's an inexpensive way to gain an understanding of this shrouded area. The tour will end at Nizammudin Dargh for the renowned Thursday evening qawwali performance of devotional songs, which gets underway at dusk. Make sure your legs and shoulders are covered. The Hope Project provides assistance to underprivileged residents of the area. Evening: After attending the qawwali performance at Nizammudin Dargh, dine on contemporary modern Indian cuisine at Indian Accent (The Lodhi Hotel, Lodhi Road, New Delhi. Phone: 11 66175151) by acclaimed chef Manish Mehrotra. It's one of only two restaurants in India to be included in the World Foodie Top 100. 8 a.m.: Start the day at Qutab Minar (Mehrauli, South Delhi. Open daily from sunrise to sunset). This UNESCO World Heritage site was built in 1206 and is the tallest brick minaret in the world. It's an incredible example of early Indo–Islamic architecture, with a mysterious history. (Entry fee: 500 rupees for foreigners and 30 rupees for Indians. Free for children under 15 years old). 9 a.m.: Next to Qutab Minar, lesser-known Mehrauli Archaeological Park is spread over 200 acres. It contains more than 100 historically significant monuments and each has a unique story to tell. Two highlights are the 16th century Jamali Kamali Mosque and Tomb, with its alluring architecture, and the ancient step well Rajon Ki Baoli. (Entry fee: Free for all). 11 a.m.: If you like Indian handicrafts, drop into Dastkar Nature Bazaar (Kisan Haat, Anuvrat Marg, Andheria Modh, Chattarpur, South Delhi. Open 11 a.m. to 7 p.m., daily except Wednesday). For 12 consecutive days every month, it has a different theme featuring artisans and craftsmen. There are also permanent handicraft and handloom stalls. 12:30 p.m.: Have lunch at Dilli Haat (opposite INA Metro Station, South Delhi. Open daily from 10 a.m. to 10 p.m.), set up by the government to give the feel of a village market (called a haat). It's a popular place to eat and shop for souvenirs from the artisans who come to sell their wares. The food court offers cuisine from the various states in India, including some delicious momos from northeast India. (Entry fee: 100 rupees for foreigners and 30 rupees for Indians. 20 rupees for children). If you want to buy clothes, nearby Sarojini Nagar market (closed Mondays) has export-surplus brand names at throwaway prices. These tips for bargaining will help you get the best deals. 3:30 p.m.: Spend the rest of the afternoon and evening at Hauz Khas Village, about 20 minutes away, where hip meets medieval heritage. If you're starting to feel tired, make Kunzum Travel Cafe your first stop. Revive yourself with coffee and cookies, and only pay what you like. 4:30 p.m.: Explore some of the historical sites around Hauz Khas, which are just meters away from Kunzum Travel Cafe. Hauz Khas (meaning "royal tank") gets its name from the 13th century reservoir there, which now has a paved walking track around it. Of note are the remains of a fort, a 14th century madrasa (an institution for Islamic learning), mosque, and tomb of Firuz Shah (who ruled over the Sultanate of Delhi from 1351 to 1388). The setting is particularly picturesque at dusk. (Entry fee: Free for all). 6 p.m.: Return to Hauz Khas Village and stroll through its atmospheric narrow lanes, boutiques and art galleries. 8 p.m.: Choose from the many enticing options for dinner. For gourmet south Indian food try Naivedyam or Coast Cafe. Not in the mood for Indian cuisine? Head to Elma's Bakery Bar & Kitchen for decent Continental food. Alternatively, Yeti The Himalayan Kitchen serves authentic Tibetan and Nepalese cuisine. 10 p.m.: Still have energy? Kick on at a bar! Hauz Khas Village is a hot party destination on weekends. Our picks are Lord of the Drinks (inside the Deer Park, Hauz Khas) for a garden setting. Hauz Khas Social (9A and 12 Hauz Khas Village) for a lively ambiance. Rabbit Hole (30 Hauz Khas Village) for its rooftop views. Summer House Cafe, Bandstand, or Auro Kitchen & Bar (all located in Aurobindo Place Market just outside Hauz Khas Village) for live music and DJs. 10 a.m. (mid-November to mid-March): Attend the weekly military Changing of Guard Ceremony held in the forecourt of Rashtrapati Bhavan, the home of India's President (President's Estate, New Delhi. Enter through Gate #2, Rajpath, near the Prime Minister’s Office, and bring photo identification). An equestrian display by the Presidents’ Body Guard is a highlight. Note that the ceremony starts at 8 a.m. from mid March to mid August, and 9 a.m. from mid August to mid November. (Entry fee: Free for all). 10:45 a.m.: Visit India's only underground museum, the new Rashtrapati Bhavan Museum (Open 9 a.m. to 4 p.m., daily except Monday. Enter through Gate #30 on Mother Teresa Crescent Road). Its event-based exhibits tell the story of the President's estate and how it functions. The many gifts that Indian presidents have received over the years are also showcased. For security reasons, advance bookings are necessary and are to be made online. (Entry fee: 50 rupees per person). Noon: Admire the Cathedral Church of the Redemption (Church Lane, near Rashtrapati Bhavan). The design of this magnificent church was inspired by the 16th century Roman Catholic church of Il Redentore in Venice, Italy. Made out of red sandstone and Burmese teak, it opened in 1931. 12.30 p.m.: Drive by Parliament House (Sansad Marg, near Rashtrapati Bhavan), where national laws are made and revised. This commanding circular-shaped building was designed by British architects Edwin Lutyens and Herbert Baker, and completed in 1927. It's not possible to enter without special prior permission. 1 p.m.: Have lunch at a restaurant on Pandara Road, about 10 minutes away, where you'll get some of the best non-vegetarian food in the city. Gulati (6 Pandara Road Market, New Delhi) has been in business since 1959, and is renowned for its north Indian and tandoori cuisine. Havemore (10-12 Pandara Road Market, New Delhi) is a must-try if you're fond of butter chicken. 2 p.m.: Depending on your interests, there are a number of ways to spend the afternoon, all within 10 minutes drive from Pandara Road. The National Gallery of Modern Art (Jaipur House, Sher Shah Road, Near Delhi High Court at the end of Rajpath, New Delhi. Open from 11:00 a.m. to 6:30 p.m., daily except Monday) is one of the world's largest modern art museums, with a collection of over 14,000 works. (Entry fee: 500 rupees for foreigners and 20 rupees for Indians). The National Crafts Museum (Pragati Maidan, Bhairon Road, New Delhi. Open from 10 a.m. until 6 p.m., daily except Monday.) is a relaxing place to see artisans demonstrate embroidery, weaving, carving and pottery. In addition, there are galleries with more than 20,000 exhibits of handicrafts from all over India, and handicraft stalls selling reasonably priced products. The museum's Cafe Lota is an alternative place to eat lunch, or go there for afternoon tea. (Entry fee: free for all. Tickets for the galleries cost 150 rupees for foreigners and 10 rupees for Indians). Prosperous Sundar Nagar is one of Delhi's top markets specializing in art and antiques. It also has some famous tea shops, including Mittal Teas (12 Sundar Nagar Market, New Delhi). It's one of the oldest tea companies in Delhi and stocks some rare teas. Don't miss Regalia Tea House and Asia Tea House, in the same location, if you're a tea-lover. Purana Qila (Mathura Road, New Delhi. Open daily from sunrise to sunset. 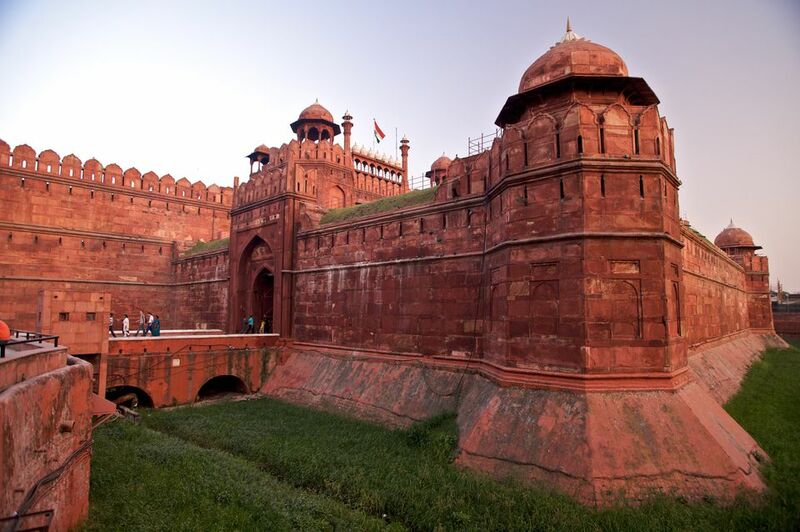 ), the Old Fort, is often overlooked by tourists in favor of Delhi's iconic Red Fort. However, it has a significant place in the city's history and much appeal. This well-maintained riverside fort dates back to the 16th century and was built by Mughal emperor Humanyun. Unfortunately, he fell down its library steps and met an untimely death. (Entry fee: 200 rupees for foreigners and 15 rupees for Indians). 5:30 p.m.: Spend sunset and early evening at India Gate (Rajpath, New Delhi). This important arch-shaped war memorial honors the Indian soldiers who lost their lives in World War I. It was designed by Edwin Lutyens, who was responsible for much of New Delhi's construction in the 1920s and 1930s under British rule. Join Delhi locals in unwinding on the surrounding lawns, while the monument is artfully illuminated. Snacks are available from roving vendors. 7:30 p.m.: Purana Quila has the best sound and light show in Delhi, and one of the best in India. It uses cutting-edge projection and laser technology to narrate the history of Delhi, starting from the 11th century reign of Prithvi Raj Chauhan to the present day. (Daily except Friday. From November to January, the English show runs from 7.30-8.30 p.m. It starts an hour later during other times of the year). (Cost: 100 rupees for adults and 50 rupees for children aged three to 12). 8:30 p.m.: Traditional Indian cuisine is given a modern twist with unusual presentation and pairings at Varq (Taj Mahal Hotel,1 Mansingh Road, New Delhi. Phone: 11 23026162), set up by prestigious chef Hemant Oberoi. The restaurant combines food with art. Its walls are adorned with the works of celebrated artist Anjolie Ela Menon, some of which date back to the 70s. 10 p.m.: If you want to party on into the night, there are plenty of options in and around Connaught Place. Kitty Su (The Lalit Hotel, Barakhamba Avenue, Connaught Place) is one of the city's top clubs that hosts international DJs, Tamasha (28 Kasturba Gandhi Marg, Connaught Place) sprawls over five indoor and outdoor areas with a creative ambiance, Tourist (1 Scindia House, Janpath Market, Connaught Place) is a travel-themed bar with innovative cocktails and a rooftop terrace with a view, Monkey Bar (3 Connaught Circus, P Block, Baba Kharak Singh, opposite PVR Rivoli, Connaught Place) has a fun vibe. The crowds at Delhi's monuments really swell on Sundays, as most people have the day off work. Hence, it's a good idea to avoid doing much sightseeing later in the day. Old Delhi and Sundar Nagar markets are also closed on Sundays. This makes it a quieter time to revisit Old Delhi. Depending on your interests, choose from the following activities. Explore Old Delhi, particularly its off-beat attractions, some more. 6 a.m.: Feeling energetic? Rise and shine early for a morning bike tour of Old Delhi operated by Delhi by Bicycle (daily, 6.30 a.m. to 10 a.m. including a stop for breakfast either at Karim's or a heritage mansion). There are three tours available, each focusing on different aspects of Old Delhi. The cost is 1,865 rupees per person. 10 a.m.: Bibliophiles will be delighted by the Daryaganj Sunday Book Market in Old Delhi (Asaf Ali Road to Netaji Subhash Marg, starting at Delite Cinema). Many thousands of new and secondhand books across all genres are piled up for sale on the pavement at super cheap prices. The market is on all day but get there early for the best books. Haggling is expected! Noon: Head to Lakhori restaurant at Haveli Dharampura (2293 Bazar Gulian Road, Gali Guliyan, Dharampura), a painstakingly restored 200 year old mansion in the heart of Old Delhi, for a lazy Sunday brunch that extends well into the afternoon. You'll be transported back to the Mughal era. A less expensive option, also in a 200 year old mansion, is the ambient Walled City Cafe & Lounge (898 Hauz Qazi Road, near Jama Masjid Gate 1). Alternatively, the legendary Moti Mahal (3704 Netaji Subhash Marg, Daryaganj), was established in 1947 after India's Independence from British rule. It was one of the first restaurants to bring Peshawari tandoori cuisine to Delhi. 2.30 p.m.: If you're a bird-lover, spend some time at the Charity Birds Hospital at Digambar Jain Temple (off Netaji Subhash Marg, opposite the Red Fort), where up to 60 birds a day are taken in and treated free of cost. 4 p.m.: Observe a free traditional Indian wrestling match, known as kushti, at Urdu Park (Meena Bazaar, opposite the Red Fort, at the end of the park near the tomb of Maulana Azad). Spend the day visiting some of Delhi's most prominent museums. 10 a.m.: Be an early bird and beat the rush to the National Rail Museum (Shantipath, Chanakyapuri, near Bhutan Embassy, New Delhi. Open from 10 a.m. to 4.30 p.m., daily except Monday). The museum is spread over 11 acres and traces the evolution of Indian Railways. It has the largest collection of railway exhibits in India, including many old steam locomotives. (Entry fee: 100 rupees for adults on weekends and 50 rupees on weekdays. Children pay 20 rupees on weekends and 10 rupees on weekdays). 12.30 p.m.: Have lunch at Bukhara (ITC Maurya hotel, Diplomatic Enclave, Sadar Patel Marg, Chanakyapuri, New Delhi. Phone: 11 26112233. ), about 10 minutes drive away. Possibly the most famous restaurant in India, sumptuous Northwest Frontier tandoori cuisine is served from its open-fronted kitchen. US presidents Bill Clinton and Barack Obama have even dined there. 2 p.m.: To learn about the life of controversial late Prime Minister Indira Gandhi and her family, who are often likened to America's Kennedys, drive about 20 minutes to the Indira Gandhi Memorial Museum (1 Safdarjung Road, New Delhi. Open from 9.30 a.m. to 5 p.m., daily except Monday) It occupies part of the place where she lived and was assassinated in 1984. (Entry fee: Free for all). 4 p.m.: End the day at the stately National Museum (Janpath, near Connaught Place. Open from 10 a.m. to 6 p.m., daily except Monday), about 5 minutes drive away. The museum was established in 1949, and is one of the oldest and largest in India. Its collection mainly consists of ancient sculptures and artwork from the Indus Valley Civilization (also known as the Harappan period), dating as far back as 2,500 BC, up to the 20th century. (Entry fee: 650 rupees for foreigners and 20 rupees for Indians). If you don't want to exclude Delhi's grungy backpacker district, Paharganj, from your trip then spend the evening checking it out. It's situated roughly between Old Delhi and Connaught Place, opposite New Delhi Railway Station. Once a major stop on the 1970s Hippie Trail, it's still an engrossing place for people watching (if you're not bothered by the congestion and cacophony). The Main Bazaar (closed Mondays) is lined with shops selling almost everything you can think of, from incense to export-surplus stock. There are also some inexpensive but decent restaurants where you can have dinner.